The first customer was the United States Air Force, which ordered five YH-19 aircraft for evaluation; the YH-19’s first flight was on 10 November 1949, less than a year after the program start date. This was followed by delivery of the first YH-19 to the U.S. Air Force on 16 April 1950 and delivery of the first HO4S-1 helicopter to the U. S. Navy on 31 August 1950. A U.S. Air Force YH-19 was sent to Korea for service trials in March 1951, where it was joined by a second YH-19 in September 1951. On 27 April 1951, the first HRS-1 was delivered to the U.S. Marine Corps, and on 2 May 1951, the first S-55 was delivered to Westland Aircraft. 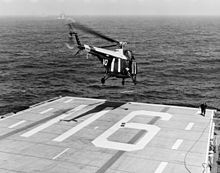 The forward engine location placed the main cabin essentially in line with the main rotor’s rotational axis and close to the aircraft center of gravity, making it easier to maintain proper weight and balance under differing loading conditions. The impetus for this design choice was the recent rejection of the Sikorsky XHJS by the U.S. Navy in favor of the tandem rotor Piasecki HUP Retriever; the Navy had strongly objected to the necessity to use ballast in the cabin-forward XHJS to maintain proper weight and balance, prompting Sikorsky to seek single-rotor design alternatives that did not require this. The YH-19 prototypes featured a blunt aft fuselage and a single starboard-mounted horizontal tailplane with a small vertical fin at its outboard end. Initial production models added a large fillet-like fin behind the fuselage and under the tailboom, and the tailplane configuration was changed to an inverted “V” shape. Early H-19 and HO4S variants were powered by a Pratt & Whitney R-1340-57 radial rated at 600 hp (472 kW) and used a centrifugal clutch that automatically engaged the main rotor when a preset engine speed was reached. However, the HO4S was deemed underpowered in U.S. Navy service with this powerplant, so the aircraft was re-engined with a 700 hp (522 kW) Wright R-1300-3 radial which the U.S. Navy found to be adequate in an air-sea rescue role; the H-19B, HO4S-3, HRS-3, and subsequent models would use this powerplant. The R-1300 models also used a single horizontal tailplane in place of the early inverted “V” style, and a new hydro-mechanical clutch gave smoother and more rapid rotor acceleration during clutch engagement and allowed the engine to be started and operated at any speed while disengaged from the transmission and rotors. The H-19 Chickasaw holds the distinction of being the U.S. Army’s first true transport helicopter and, as such, played an important role in the initial formulation of Army doctrine regarding air mobility and the battlefield employment of troop-carrying helicopters. 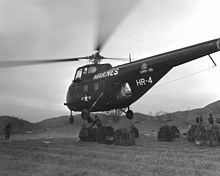 The H-19 underwent live service tests in the hands of the 6th Transportation Company, during the Korean War beginning in 1951 as an unarmed transport helicopter. Undergoing tests such as medical evacuation, tactical control and frontline cargo support, the helicopter succeeded admirably in surpassing the capabilities of the H-5 Dragonfly which had been used throughout the war by the Army. A U.S. Navy HO4S of HS-4 taking off from USS Badoeng Strait in 1954. Note inverted “V” tailplane typical of early models with R-1340 engine. The U.S. Air Force ordered 50 H-19A’s for rescue duties in 1951. These aircraft were the primary rescue and medical evacuation helicopters for the USAF during the Korean War. The Air Force continued to use the H-19 through the 1960s, ultimately acquiring 270 of the H-19B model. The H-19 was also used in the early days of the Vietnam War before being supplanted by the Sikorsky H-34 Choctaw, which was based on the H-19. The H-19 left U.S. military service when the CH-19E was retired by U.S. Navy squadron HC-5 on 26 February 1969. Surplus H-19s were sold on the open market, and civil interest was sufficient that Sikorsky (and later Orlando Helicopter Airways) offered conversion kits allowing a military surplus H-19 to be commercially operated under a standard Federal Aviation Administration type certificate as an S-55B. [note 2] Turboshaft conversions and a novel campervan-like “Heli-Camper” conversion—featuring a built-in mini-kitchen and sleeping accommodations for four—were also offered by aftermarket modification companies. H04S-3 for Royal Navy, 15 delivered.